Emma Lawes - Ladies' Outfitter (K1896). 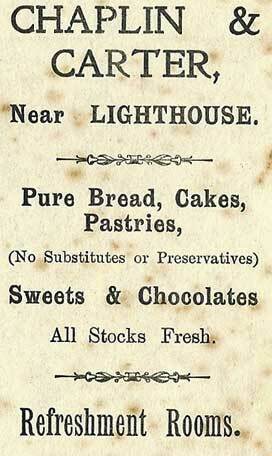 She probably occupies only the left hand portion of this large house, the right hand side being a bakery; see below. 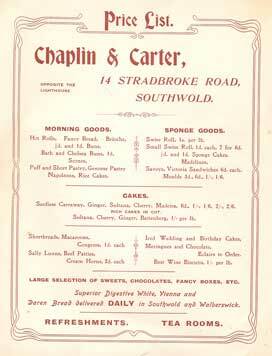 Chaplin & Carter - Baker, Cakes, Pastries, Refreshments (SN1903, K1908). According to an editorial in 'Southwold and Neighbourhood', Chaplin & Carter takes over the existing, well established bakery set up here by Robert Newson in 1896. Chaplin & Carter (SRB 1939) It is believed that Chaplin & Carter ceases trading at about this date, although Mr C O Carter himself continues to live at this address. E Webb & Sons (Norwich) Ltd - Bakers & Confectioners (CSP1953). Mrs Rosemary Muffet - Manager of the Leukaemia Research Charity shop. .
Chaplin & Carter in 1903. 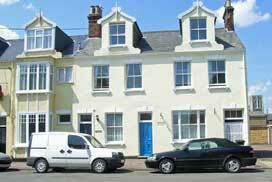 The shop front appears to be located across the two windows to the left of the blue door in the top picture. The photograph is reproduced from an article in 'Southwold & Neighbourhood, published in about 1903. To read the full article, click the picture. 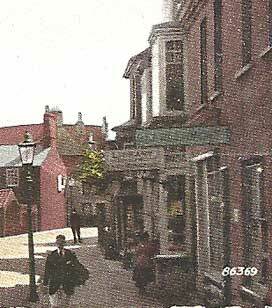 The Carter familiy outside their home (to the right of the shop) probably in the early years of the 20th Century. Note the bread delivery hand cart. Please get in touch if you can identify any of the people. 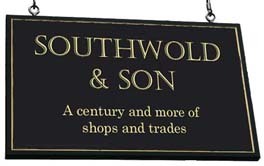 Advertisement in 'A Guide to Southwold', approx 1905. With thanks to Robert Temple. Chaplin & Carter price list. Date not known but possibly early 1920s. 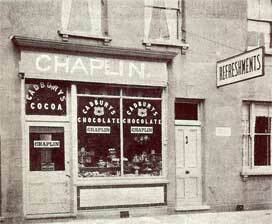 The Chaplin & Carter shop sign in the foreground says 'Refreshments'. Enlarged from a 1925 postcard in the Robert Palmer collection. 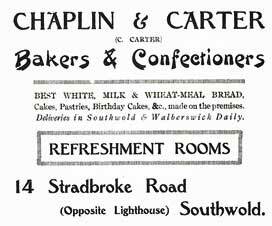 By 1930 (advertisement above) Chaplin & Carter was no longer advertising refreshment rooms but mentions a branch at Walberswick. 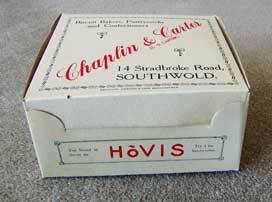 Chaplin & Carter cardboard cake box dating from before the Second World War. Property of David Baker who kindly provided this photo. 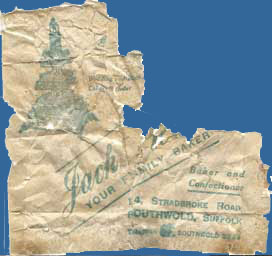 Fragment of a paper bag, probably from the 1960s, with the Jack Webb stamp, found under the floorboards of a neighbouring house. With thanks to Jeannette Radley-Kane, current owner of No14..